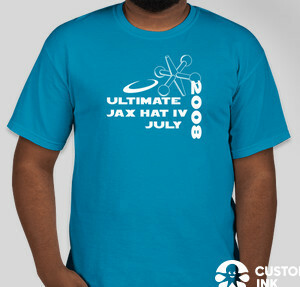 I worked on two three Jax Hat IV shirt designs last night. One is a design I started two years ago, meant for the back of that year’s shirt, but was abandoned. The second design I dreamed up at dinner last night. Update: I added another design on July 20 (shown here on pink). And the new green one has added figure. Update 7/22: I turned in the shirt order Monday and we went with the design on the pink shirt above. I added some others, but I’m still leaning towards the first one. yup, i like the green one also.